Mexico Artisan Crafted Flower Earrings in Sterling Silver, "Spiritual Blossom"
In pre-Hispanic art, the moon goddess Ixchel is often depicted holding a lotus blossom. The Maya deity inspires these exquisite earrings. Handcrafted of sterling silver, the floral buttons are the work of Francisco Sanchez. "The lotus symbolizes spirituality," the Mexican artisan confides. 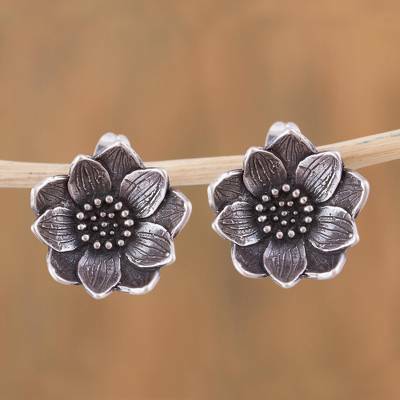 You can find sterling silver button earrings 'Spiritual Blossom' by Francisco Sanchez in jewelry categories such as Floral Earrings, No Stone Earrings, Silver Earrings, Sterling Silver Earrings and Button Earrings. Enjoy exploring these sections for other Novica treasures.